Home / Home Slider / Is your teenager ready to stay at home alone? Is your teenager ready to stay at home alone? If you’re a parent of a teenager, sooner or later they’re probably going to stop wanting to come on your family holidays. If they’ve already seen their 18th birthday by the time this happens, then you should be able to set off without them – they’re an adult, after all, and so hopefully they’re broadly capable of looking after themselves while you’re away. However, if your younger teen decides that they’re not keen on a family trip, it’s not so straightforward. I’ve already written about how to get them to come with you (if you want them to) in my post ‘What to do when your teenager doesn’t want to come on your family holiday.’ But what if you can’t persuade them to join you on your travels, or if you want to go on a trip without them, as we did? When is it OK to leave them at home without an adult? The first thing to think about is the law. A child is defined by the United Nations as anyone who’s under 18. According to the UK Government website, there’s no specified age for when a child can be left alone, and we parents need to use our judgment to decide when our child is mature enough for us to take this step. It’s an offence to leave a child alone if it places them at risk, and parents can be prosecuted for this. The website refers to guidance from the National Society for the Prevention of Cruelty to Children (NSPCC) which says that children under 16 shouldn’t be left alone overnight, and although this guidance isn’t laid down in law, I reckon that it’s best to follow it. 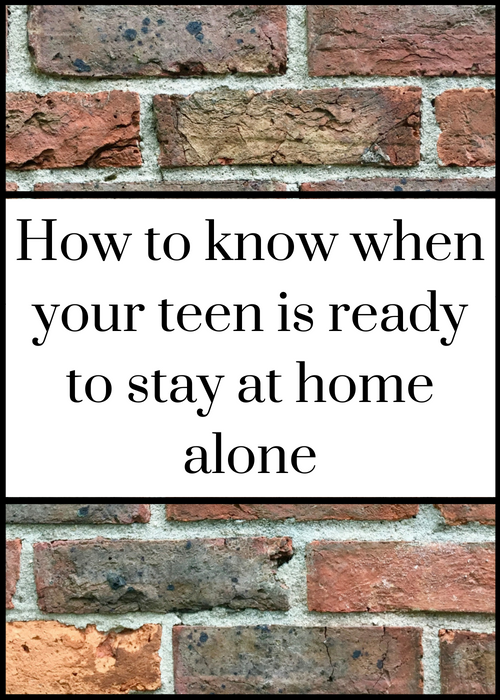 Is your teenage child ready to stay at home alone? If you answer ‘no’ to any of these questions, your child probably isn’t yet ready to stay at home without an adult while you travel. Q1 Are they 16 or over? No – don’t leave them. Yes – go to Q2. Q2 Are they happy to be left at home alone overnight and during the day while you’re on a trip? Yes – go to Q3. Q3 Do you think that they’re mature and sensible enough to stay at home alone? Yes – go to Q4. Q4 Do they know how to cook for, feed and take care of themselves while you’re away? Yes – go to Q5. Q5 Would they know what to do if there was an emergency and they were home alone – for example, a water leak in the bathroom or a cooking fire in the kitchen? Yes – go to Q6. Q6 If there are siblings at home, do you trust them to be sensible and safe together without an adult there? Yes – go to Q7. Q7 If you’re leaving a pet at home, is your child responsible enough to care for it while you’re away? Yes – go to Q8. Q8 Would they know what to do if they were injured or ill? Yes – go to Q9. Q9 Would your teenage child be able to contact you or another responsible adult in an emergency? Yes – go to Q10. Q10 If you’re travelling during term time and your child is at school, do your trust your teenage child to go to school while you’re away? No – don’t leave them. The law says that you’re responsible for making sure that your child attends school. Yes – it sounds like your teen may be ready for you to leave them at home alone while you go on your travels. How very exciting! If you’ve left your teenage child at home alone overnight to go on a trip, how was it? If you haven’t reached this point yet, how do you think you’ll feel about it if and when you do?